IBERIA, the masterwork originated by Isaac Albéniz in 1908, is a passionate homage to virtuosity. The piece was originally composed for the piano and later for orchestras many times over. Albéniz paints a versatile musical picture of his home in Spain in the form of impressionism. The 12 individual pieces, which can be played in any order according to Albeniz, bear the names of cities, districts, religious festivals, dances and rhythms in Spain. These serve Albéniz as a draft for moods and images, which he implements into music, integrating various rhythms of folk music and flamenco into his composition. This resulted in an incredibly diverse work in rhythm, style and expression, which demanded the highest level of virtuosic skill from his performers. 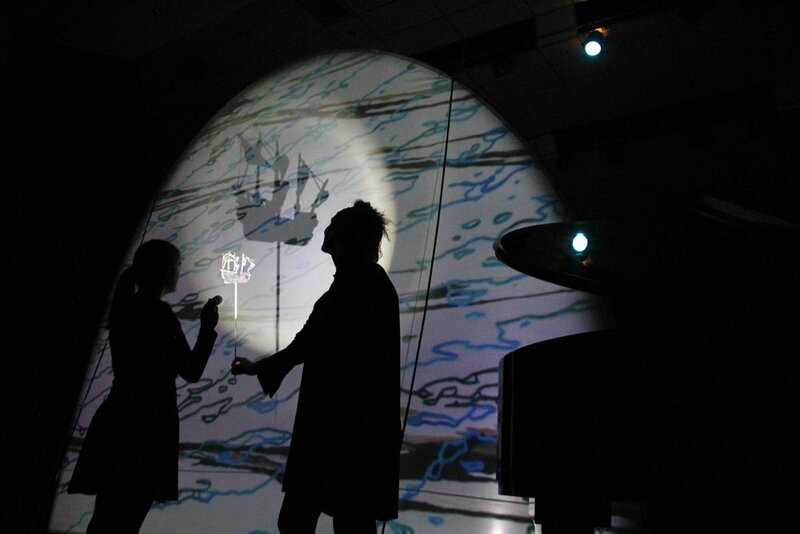 IBERIA combines theatre, concerts and visual arts: Karin Schäfer created a visual spectacle for this impressive music. She is inspired by the numerous styles and works of visual artists, who transform them into moving images in an equally pointed and humorous way. 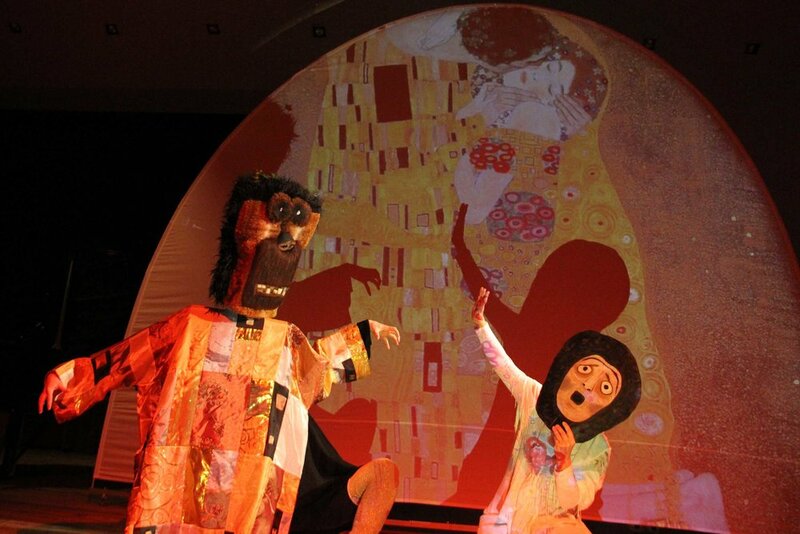 Puppets, masks, videos, shadows, animation, movement and music merge into a work of art that illustrates Albeniz's masterpiece and makes it possible for the audience to visibly experience everything with their very own ears and eyes. The visual execution shows impressionism, like the composition: the images speak for themselves – they do not always have direct connection to the title or the music - sometimes with or without a "deeper meaning". The individual scenes, including all videos, projections, and animation sequences, have been created over several years in the workshop of Karin Schäfer’s puppet theatre. Based on her intensive engagement in visual arts, the construction of puppets, props and stage sets are very much influenced by her creative work. Karin Schäfer is able to combine different inspirations from various works of visual art into her work. Just as Albéniz incorporates individual melodies, rhythms and motifs in his composition from the traditional music of Spain, Karin Schäfer also uses elements of numerous works by visual artists as visual-theatrical homage to combine something completely new and unique. Means "conjuring up, revival, memory" and Albéniz conjures up his memory of the historical quarters of Spain right from the beginning; traditional, religious customs, ancient rhythms, to which he puts together, in contrast, an extremely modern and innovative musical implementation. We begin with the "awakening" of an image - a large-scale painting by Karin Schäfer, which she painted over a period of several weeks, and then step by step, created an animated film. We can see in this process a reproduction of what makes us so fascinated with seas and oceans: they are infinite, complex, multidimensional and versatile, she paints in layers of endless movements of waves and the mirrored sky above, at the bottom of the level are fish and marine animals moving and on the second level in front of the picture, a ship repeatedly crossing the painted ocean, as man navigates the sea to continually break into new shores. Finally, another layer is brought live onto the stage: taking elements of sea paintings by Henry Matisse, are placed as a shadow play over the huge luminous painting. The harbour - a wild force is prevailing, it is a starting point to reach horizons and find new ones. It is a place of desires and dreams, unruly, incomprehensible, and virtually surreal. A puppet - a white, indescribable, small figures – turns into a kind of bird and mixes with elements by the surrealist René Magritte. The camera and the projection reflects everything into a seemingly endless infinity, many times, until it disappears altogether between the heaven and the sea. This is the most virtuosic piece in the piano cycle, referring to the Corpus Christi parade in Seville, where the visual implementation borrows the same pompous movement using the statue of the Virgin Mary in all of Spain. To broach the subject of society’s enforcement of religion on women, a target against this, is a symbolism of self-liberation: “Open eyes”, is inspired by the plentiful pair of female eyes from the world of painting. Is a district in Sevilla, it is considered one of the cradles of Flamenco. It shows its guests two very different faces: on one hand, filthy, narrow and dangerous streets, full of dubious figures, and on the other, a place full of genuine artistic expression. On the other side of the stage stands a double-sided pair of masks based on Klimt’s famous painting “The Kiss”, where the protagonists come to life, where each one come into conflict showing, very surprisingly, different sides of their faces. Is the city quarter for Flamenco in Granada, believed to be as equally famous as other cities in Andalusia. In Flamenco, the "Zapateo" transforms the shoes of the dancers into musical instruments where the dancers mirror the rhythm in Albéniz’s music using their shoes. Through a different kind of mirror we observe the ambience of life in a Spanish place from a whole new perspective, that is to say from below! As if the floor were made of glass and we could look up from below, from there we can see the short, everyday scenes in "El Albaicín" - depicted by Barbie dolls shoes and props. Is an Andalusian dance but is actually a "cante jondo", which is heavy and serious but here with Albeniz, it sounds rather weightless and flowy. Karin Schäfer also has spherical balls of Albéniz’s life floating around on the stage á la H.C Escher, everything is black and white, like silhouette paper cuts from around that era. Many balls burst like dreams and illusions as if they were touched by a long finger of fate. A chronicle of light-footed trickery, which fits to the ambivalence of the music and rhythm, suggesting that life is fragile- Albéniz has enjoyed his life widely, but only for a short 49 years of age. "... de la Frontera" is the full name of the capital, well-known for its Spanish sherry. Located in the inner city but "on the border" – for centuries it was shattered by the conflicts between the Christians and the Moors, later it then became rich and famous because of its vast winery. “The Last Days of Humanity” by Karl Kraus, inspired by the artist Deborah Sengl and her work, it creates a picture of time that’s “on the border”: A baroque wig which symbolizes a rich, abundant, corrupt society and rats, announcing an end to the morbid and subduing era. Unfortunately till now, no. However we have a recording of a complete concert online, if you wish to see this recording, we’ll be more than happy to send you the link to watch it. If you are interested in schedule the show or if you’re a journalist who would like to report about our work, or you are interested in it for any other reason, we’ll gladly send the link, as long as you promise to come to our next live-concert around your neighbourhood and that under no circumstances you share the link. How can one book the show? If you wish to book one or several performances then please send an email to the following address: tour@figurentheater.at and we’ll get in touch with you as soon as possible. Would it be complicated if we wish to show the play in our venue with an orchestra or a pianist? Generally no, however a sufficient stage would be required: min. 12m wide and 6m deep INFRONT of the pianist or orchestra. We would need 3 hours to set up our stage design and another 3 hours to install the stage lights which should already be available in the hall (we will bring our own video projectors and cameras and we will gladly send a technical rider on request). Furthermore, 1 or 2 rehearsals with the pianist and alternatively the orchestra (after having a preliminary meeting with the conductor) would be required. How many members of the audience are able to come and watch and is there an age limit? The play is penned towards adults, 12 years and upwards are welcome. Depending on the capacity of the hall, up to 1500 members of the audience can attend the show. In what language is the play performed? It’s a visual concert performed without words, it can be understood worldwide. We’ll happily send you a cost estimate of fees and travel expenses without any obligation, if you let us know when, where and in what setting you would like us to perform. Several performances at the same location is a lot more cost-effective than a single performance. For this performance we are a team of 5 people: 3 performers, 1 light technician and 1 manager, who’s also responsible for the projections on stage. We would happily come with a pianist and we would gladly work with a pianist who is already there. We cannot bring an orchestra with us – but we do however look forward to working with any orchestra or other ensembles who play “IBERIA”! We are able to completely fill a concert stage with our performance, but everything we use on stage is built in such a way that it is transportable and easy to fold up. The props, costumes and equipment fit into a few metal boxes which we usually bring as normal flight luggage. Due to our extensive travel experience with international guest performances, we have ensured everything is compact and easily transportable. You’ll see a line-up of the production team with whom we usually travel within the following attachment. Which of the 12 music pieces are played and in what order? We plan on transforming also the remaining 4 scenes into images in a near future. Further information on the musical pieces and their titles can be found on Wikipedia.